Iorigun formed from the ideas of Iuri Moldes (vocal/guitar) and Moysés Martins (bass/vocal) in 2014. They come from Feira de Santana, the second biggest city in the State of Bahia, famous for its sunny weather, Tropical coconut beaches and samba-reggae. Finding comfort and inspiration in colder, darker sounds, they later joined forces with Leonel Oliveira (drums) and Fred Lima (guitar/vocal) to record their first EP “Empty Houses // Filled Cities” released by themselves in October 2017. Their music deranges from the place they live: its fast beats and gloomy guitar riffs, with direct post-punk influences from the 80′s may also be compared to 00′s Interpol, Iceage, Yuck, Place to Bury Strangers. All these influences are strange to Feira de Santana listeners. 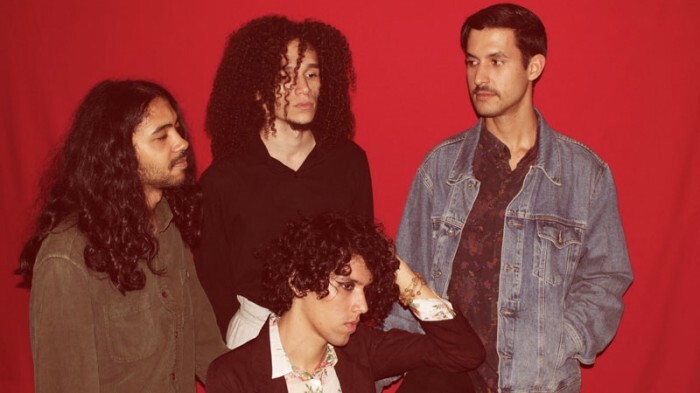 In its first years, the band decided to travel around the region, especially to 1h30 distant Salvador, betting on their live performance to gather new audiences. And it worked. Some Brazilian blogs listed Iorigun as one of the acts to keep an eye on for 2018. In August 2018, they became part of midsummer madness’ casting and their first EP started being distributed by the label as an introduction to their new material, recent released second EP “Skin“. Constantly creating new songs in arid Feira de Santana left the quartet with a difficult task of choosing songs for the 2nd EP. During this selection process, Brazil was facing a troubled political moment, an unexpected wave of conservatism that resulted in the election of a far-right Christian President. Iorigun felt some thoughts should flourish in “Skin”. Musically, they abandoned melodic riffs, embracing strangeness and obscurity. Tension, fear and despair are results of this excavation of oneself. In shock, they asked themselves: “Why waiting for something from someone if it is already so difficult to expect some change from ourselves? We need to set the example“. “IORIGUN is a Brazilian post-punk quartet inspired by the likes of The Cure, Foals and Diiv. The band’s self-produced, four-track debut EP – Empty. Our Song of the Day, “Crash Into The Sun,” is’ Empty. Houses / / Filled.